What happens when theblacks criminals break into your house? You pick one of your 63 guns off the shelf, shoot them until their brain matter splatters all over you, and lick your fingers after a job well done, right? But what if these criminals are there to take away your God-given Second Amendment rights by stealing all of your guns? This is the premise of a hilarious service, the aptly-named hideyourguns.com, which advertises on conservative websites. This thing wants to sell you a $60 manual (please look at the cover art) that will keep you one step ahead of the criminals who want to steal all of your precious guns. At first look, this may seem like one of those "I'm a suburban mom that made sixty-thousand acai berries online by following this one old secret" ads that pop up everywhere. But this is DIFFERENT. As those punks left my house that day they must have been feeling that they had cleaned me out completely. But even with a broken wrist I got the last laugh. Here’s why: I had a secret cache of weapons hidden deep inside my house, where no thugs or even a sophisticated criminal would ever think to look. I knew that hidden safely away in my house was my real gun collection, the one worth thousands of dollars and including muzzle loaders from the War Between the States and a few guns my grandfather gave me when I was young. The truth is, even if they had known where to look, they wouldn’t have gotten them. HAHA! See, you have to trick those blacks criminals into taking your decoy guns, the ones you don't even care about that much! That is part of this ingenious wingnut secret! If you're shocked by straight talk about the nature of the crisis facing our country, this book may not be for you. And if you're a liberal and are offended by talk about God and country, this is definitely not for you. Oh goody! This important information is only available to us patriots! 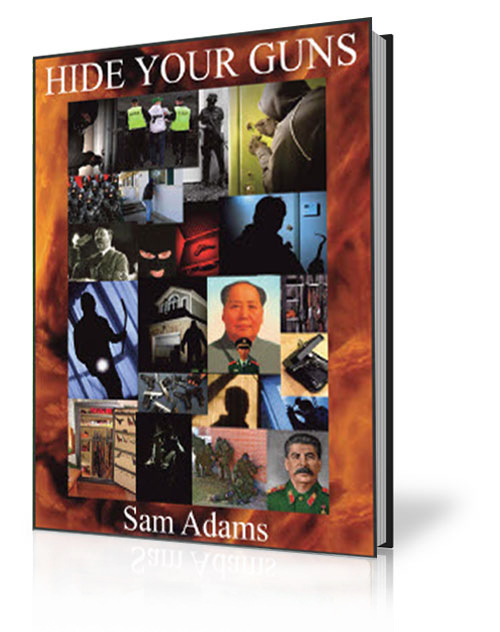 But I do give you step by step examples you can implement immediately to secure your guns, gold and other valuables. With this new-found knowledge you’ll remain one of the few armed citizens when most of the pathetic sheep are rendered defenseless. how you use it and who you tell about it. This book is the only one of its kind in the world, sort of like having your own private pass to Fort Knox, where your guns and valuables are safe from predators. Please folks, do not keep your guns in hollowed-out books like the one "Sharkman" shows us in the video and tells us is very popular. Get out your Ron Paul coins and buy this book now!